Is Your Organization’s Internal Financial Reporting Process Exactly Backward? Why is it that in many nonprofit organizations, the top leaders and decision-makers of the organization, who are not accountants, are given the organization’s critical financial information in a format designed by accountants for accountants? The non-accountant leaders are expected to be able to interpret financial statements, spreadsheets with rows and columns of numbers, and other similar reports – and use them to make critically important strategic decisions. For some reason, many organizations have allowed themselves to get it exactly backward in terms of the way financial information is provided to top leaders and decision-makers. The decision-makers are not driving the nature and format of internal financial reporting…the accountants are! An organization’s internal financial reporting function is a means, not an end. Just as a car driver uses a variety of sources of information for the purpose of facilitating decision-making in driving toward the destination, a nonprofit organization leader uses financial reporting for the purpose of wise decision-making regarding the organization’s operations and activities. The accounting and financial reporting function serves a supporting and informational role with respect to the leadership of the organization. Information provided by the financial reporting process must be timely, accurate, and relevant. A car driver needs to know that his automobile is low on fuel before it is empty and he is stranded. Similarly, organization leaders need timely, accurate, and relevant financial information in order to be apprised of current conditions and in order to make the best possible decisions. Financial information must meet all three of these attributes in order to truly be helpful to organizational leaders in their decision-making. Financial reports must also be clear and understandable. On occasion, a symbol may light up on a car driver’s dashboard that the driver doesn’t recognize. While the symbol may indicate that something about the vehicle requires attention, if the driver doesn’t know what the symbol means, it is of little value. Is tire pressure low? Is there a problem with the engine? Do I need to stop the car now? A mechanic at the repair shop may know what the symbol means, but that doesn’t help the driver when he needs the information the most. And the driver can’t carry the mechanic along with him on every trip. Similarly, financial reports must be provided to decision-makers in a form and language that they understand. Financial reports that are presented in a highly detailed or technical format are often of limited value to organizational decision-makers. Accountants and others who prepare financial reports must take into consideration the fact that the internal users of the reports are not accountants. Who Says Internal Financial Reports Must Look like Financial Statements? The terms “financial reports” and “financial statements” are not synonymous. Financial statements are a type of financial report but not every financial report is a financial statement. As described above, internal financial reporting has as its primary purpose providing leaders with financial information that allows them to assess the financial condition of the organization, assess the financial results of its operating activities, and to make wise and informed decisions about the operations and activities of the organization. Since most nonprofit leaders are not accountants, the nature, content, and format of the financial reports provided to decision-making leaders should facilitate their understanding and decision-making and should not be in a format that only an accountant or financial professional can understand. Accordingly, it is likely that financial statements are among the least helpful financial reports to be used by organizational leaders. Leaders need financial information that is presented in a user-friendly format, in plain language, and in a manner that highlights or otherwise directs attention to matters that require attention. Additionally, the most helpful financial reporting information for decision-makers is likely to include a combination of financial and nonfinancial information. Financial information alone presents an incomplete picture in many circumstances. For example, if a nonprofit leader were to learn that contribution revenues increased for the first half of the year by 20 percent, that may sound like excellent news on its face. 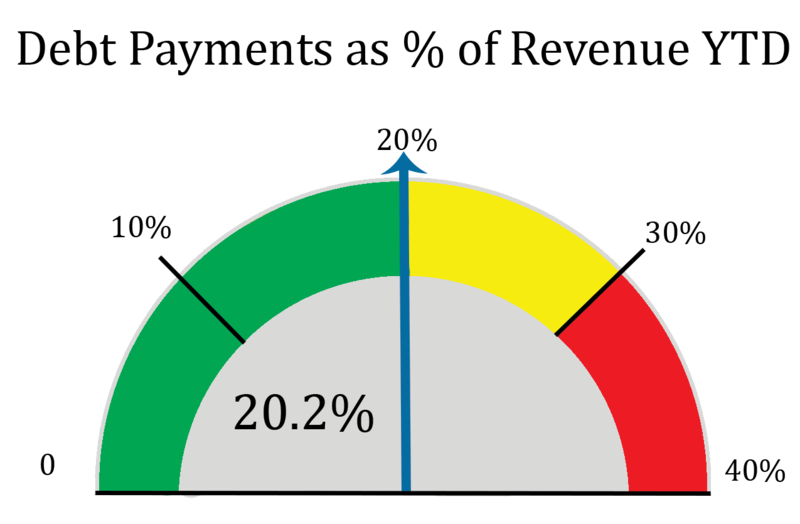 However, if the information about the 20 percent increase in contributions were accompanied by information indicating that one donor made a large gift accounting for more than the 20 percent increase, and that the number of donors giving had actually declined during the first half of the year, the organization’s leadership would have a much more complete picture and would likely reach different conclusions. With respect to internal financial reporting, there are no rules or laws that dictate the nature, scope, or format of the internal reports provided for the organization’s leadership. Accordingly, financial reports should be presented in the manner which is most helpful to those who are using them. Graphs, charts, dashboard-like “gauges,” and plain-language narratives are likely to provide the most helpful information in most circumstances. The organization’s overall financial position improved during the month of October as compared with September. Contribution revenue was $216,000 for the month of October as compared with approximately $184,000 for September. 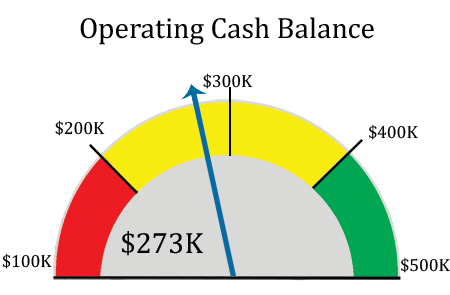 The operating cash balance has increased from approximately $430,000 at the end of September to approximately $470,000 at the end of October. The number of donors making a gift for October also increased to approximately 2,880 as compared to about 2,700 for September. 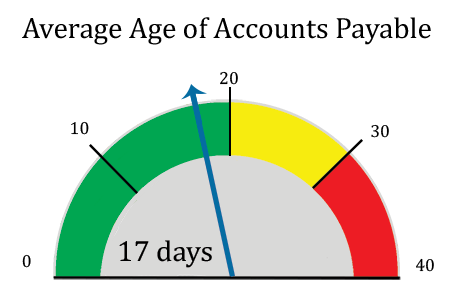 The age of accounts payable invoices remains consistent at approximately 17 days. The organization continues to pay its bills in a timely manner. Debt payments as a percentage of overall revenue year-to-date is at approximately 20.2 percent, which is within the range the organization has deemed acceptable. Given the upward trending in giving, the overall outlook is good at this time. 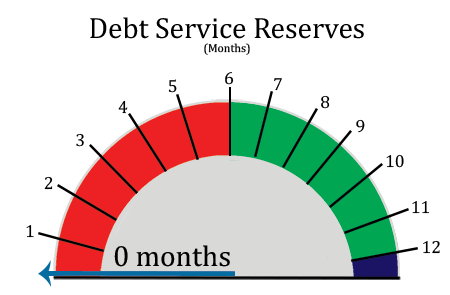 We have not yet made meaningful progress toward achieving our goal of maintaining a debt service reserve equal to six months of debt service costs. We plan to begin to address that goal as part of the upcoming year’s budgeting process. The users of internal financial reports typically include members of the organization’s management, financial oversight committees, and the organization’s governing body. In designing a system of internal financial reporting, those who are responsible for preparing financial reports must take into consideration the specific users or audience for which the financial reports are to be prepared. They must also take into consideration the nature and scope of information that each user or group of users needs in order to effectively carry out their duties. For example, the chief financial officer of an organization will likely need financial information that is more detailed in nature and scope than the information needed by the governing board. Additionally, the CFO will likely need specific information regarding the financial activities of all areas of the organization’s operations, whereas department heads may only need information regarding the financial activities of their respective departments. What Information Should Be Covered by the Internal Financial Reporting Process? Is the organization’s current liquidity sound or strong? On what do we base our opinion? How do we know? Is the trending in the organization’s liquidity improving or declining? Elaborate. What is the organization’s current balance for cash and other liquid assets overall? What is the balance net of donor-restricted and designated amounts? Provide details. If current accounts payable and other similar liabilities were paid, how many months of cash operating expenses would the current cash and liquid assets balance (net of donor-restricted and designated amounts) cover? How does the answer to this question compare to the organization’s objectives? 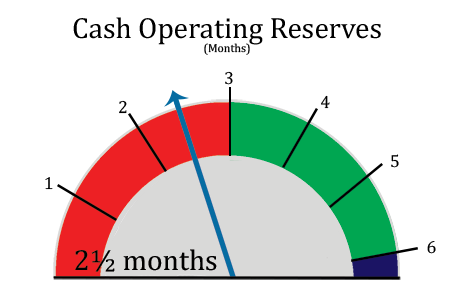 Is there a plan in place to improve the operating cash reserves balance? What is the plan? How are we doing with respect to implementing the plan? Is the organization paying all of its bills on time? How do we know? Has the organization had any trouble in recent weeks or months meeting its cash flow demands? If yes, elaborate. Does the organization expect to have any trouble in the foreseeable future with respect to meeting its cash flow demands? How do we know? If yes, elaborate. Has the organization borrowed any money to fund regular operations or noncapital outlays? If yes, elaborate. Has the organization dipped into donor-restricted or designated cash or investment balances in order to fund operations at any point during the last year? How do we know? If yes, elaborate. What is the current balance of the organization’s mortgage or long-term debt? Are debt payments being made in a timely manner, without any difficulty? Are there any specific financial covenants contained in the organization’s loan agreements that stipulate specific financial requirements the organization must meet as a condition of complying with the terms of the loan? If yes, provide details with respect to the nature of each covenant as well as the organization’s compliance with the terms of the covenant. What percentage of the organization’s total revenues is being spent on servicing the organization’s debt? How does the answer to this question compare with organization’s objectives? What is the ratio of the organization’s total liabilities to the organization’s unrestricted net assets? What is the balance of the organization’s debt service reserves? How many months of debt service for the organization’s existing mortgage debt will this balance cover? Is there a plan in place to improve the debt service reserves balance? What is the plan? How are we doing with respect to implementing the plan? Is there any information regarding the organization’s overall liquidity or financial position not addressed by the above questions of which the organization’s leadership should be aware? If yes, provide details. Is the trending with respect to overall revenue favorable or declining? If declining, what are the causes, and what is the organization’s leadership doing to address the matter? Is per capita giving trending favorably or unfavorably? Provide details. What other information about the organization’s revenues (especially revenues not related to contributions) is relevant to organization leadership? With respect to expenditures, is the organization’s staff leadership adhering to budget parameters? How do we know? Are expenditures increasing or decreasing? Are appropriate approval processes in place for all expenditures? Elaborate and succinctly describe the approval process for all areas of expenditure. Is there any additional information about the organization’s expenditures not covered by the questions above that would be relevant to the organization’s leaders? Is the organization generating a cash flow surplus from its operating activities? Why or why not? How do the organization’s financial operating results compare with expectations as set forth in the approved budget? Are there any current vulnerabilities, specific risks, threats, or other similar matters that could adversely affect the organization’s financial condition? If yes, elaborate. On a scale of 1 to 10, where 1 is very weak and 10 is extraordinarily strong, how would the organization’s staff leadership rate the organization’s current financial condition? Explain the basis for the rating. Note – Responses to key questions should be provided in plain-language. A perfectly acceptable format for a portion of the organization’s internal financial reporting may very well be a Q&A format where questions like those in the examples above are provided along with appropriate responses by members of the accounting and financial management team. Such a format can cover a particular period of time. Once responses are formulated to the questions, the responses can be updated each time new reports are required. If changes to the responses are highlighted, users of the reports can quickly and easily identify new information. Of course, the organization’s accounting and finance team should have appropriate schedules and details available to support the responses. If an organization leader does not completely understand the internal financial reports that are being provided to him or her, or if the leader feels that he or she needs additional information beyond what he or she is receiving, that leader should work with the organization’s accounting team to revise and improve the financial reporting process. An organization leader should never be intimidated if he or she does not understand information in the financial reports. If the leader has significant overall management responsibilities for the organization and does not adequately comprehend the financial reporting information he or she is receiving, the leader cannot carry out his or her responsibilities adequately. While a leader responsible for overseeing the business activities of an organization should have business experience, if the financial reports do not provide information in a manner that facilitates understanding by the leader, the problem is not likely with the key organization leader – more likely, the problem is with the internal financial reporting process. While organization staff leaders need not be accountants in order to carry out and manage the day-to-day business activities of an organization, it is important for a nonprofit organization to have appropriate oversight of its financial activities by the governing body (board) or a committee charged with that responsibility. Commonly, a finance committee or its equivalent is charged by the board with the responsibility of overseeing an organization’s financial operations. Whether a finance committee or the board itself carries out the responsibility, financial oversight must be performed as part of the governance process under the authority of the board and must be applied in a diligent and consistent manner. Appropriate financial oversight requires assessing the organization’s financial condition and financial activities in a manner that may differ from that applied by the organization’s staff leaders. At least some of the people responsible for performing governance-level financial oversight should be financial professionals – accountants, corporate finance executives, bankers, etc. Having financial expertise in the board-driven financial oversight process is essential for the board to carry out its legal duties in overseeing the financial affairs of the organization. Given the fact that the body responsible for financial oversight will or should be composed at least in part of financial professionals, the nature and format of reporting to the financial oversight body may vary from the reporting provided to staff leaders. For example, financial professionals may be accustomed to reading and evaluating formal financial statements. An effective organization financial reporting system will include the ability to produce accurate and timely financial statements in a proper format for the financial oversight body. The organization’s accounting team should also produce whatever other reports the oversight body requires and should do so in the format prescribed by the oversight body. The financial oversight body may prescribe reporting formats that include not only financial statements, but also other reports in plain language to help facilitate their understanding. When that is not happening, the solution is not to attempt to convert a decision-making organization leader into an accountant. Rather, the organization’s accounting team must adapt its reporting to the needs, language, and experience of the organization’s decision-makers. This publication is designed to provide accurate information regarding the subject matter covered. It is provided with the understanding that the material contained herein does not constitute legal, accounting, tax or other professional advice. If such advice or assistance is required, the services of a competent professional should be sought. This document is copyrighted. All rights reserved. Infringement of the copyright may result in civil liability. For permission to reprint, please contact us.